What if my monitor is out of the weight range of the UPLIFT View Monitor Arm? Your monitor must be between 4.4 and 19.8 pounds in order to work with this monitor arm. If your monitor is outside of the weight range, the counterbalance mechanism will not function properly and your monitor will not stay in place. How do the View's USB ports work? There are two USB cables that run out the back of the View's base. Once you plug these cables into your computer's USB ports, you will be able to use the View's ports as though they were connected to your computer! How do the USB ports charge my stuff if this doesn't have a power cord? USB 3.0 ports draw power from your computer, giving you the ability to charge devices from atop your desk instead of having to reach under to plug your phone into the wall. Is this arm better than the original UPLIFT Monitor Arm? Both arms have great features, it just depends on which features you prefer. The original UPLIFT Desk Monitor Arm is a solid arm that provides easy height, depth, and tilt adjustment. The View Monitor Arm has a slightly larger weight capacity, but smaller depth adjustment range. However, the ease of having USB ports built into the base is a great feature! What kind of connection is required on my computer to be compatible with the View monitor arm? If your computer has USB ports in it then it is compatible with the UPLIFT View Monitor Arm. Are these USB 2.0 or 3.0 ports? The View features USB 3.0 ports, which provide faster data-transfer and charging. USB ports are backwards compatible. You will still be able to plug USB 3.0 cables into USB 2.0 ports on your computer, however you will only have the speed of the USB 2.0 port. 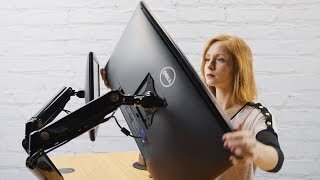 What size monitor will this arm hold? The View will hold 10" - 30" monitors. It sounds like you just need to counterbalance the monitor arm to the weight of your monitor. This is simple, just use the included Allen wrench to turn the tension control screw located in the middle of the arm. If you monitor is dropping, then you will need to adjust the tension screw towards the "+" sign. If your monitor keeps getting higher, then turn the tension screw towards the "-" sign. Just make small adjustments until you find that your monitor stays put! The UPLIFT View Monitor Arm comes in gray or white. Looking for a way to elevate your laptop, too? Might we suggest the View Laptop Mount, which can be added to any UPLIFT View single or dual monitor arm and fits notebooks 10.1'' - 17.3''? It mounts directly to the arm's VESA plate, converting the monitor arm to an adjustable laptop mount, allowing you to raise your laptop screen to a more ergonomically correct height. When uplifted, we recommend using an external keyboard and mouse to maintain proper ergonomic positioning of your arms at your desk. Designed to support monitors ranging from 10" - 30"